I had promised the boys that if we could have a better morning Tuesday I'd take them on a field trip. We were all excited to go and the boys behavior toward one another was amazing! They were willingly helping each other pack lunches, reminding one another not to forget water bottles or sneakers. It was great! 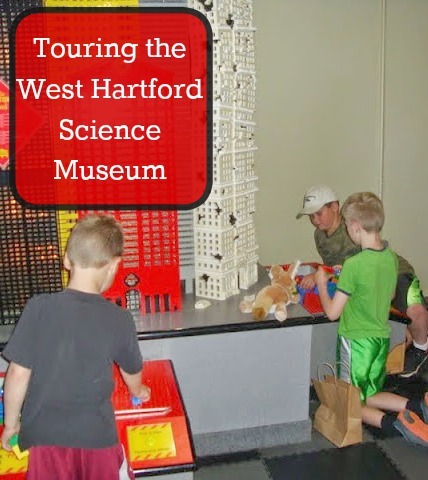 We decided to head to the Children's Museum of West Hartford. We were surprised by just how crowded the museum was; with two or three buses there and most of the parking spots filled we knew going in that we were definitely going to be waiting our turns for most everything. We were pleasantly surprised that being flexible allowed us to play in many spaces by ourselves or with just a few others. We spent two hours looking at all the animals that are there both inside and out. We saw Fennec foxes, chinchillas, a Lynx, an owl, a lot of snakes, tarantulas, scorpions, lizards, and turtles. They even had a butterfly tent set up with three different species of butterflies inside. The lady was kind enough to show the boys some caterpillars and butterfly eggs too. A legless lizards; not to be confused with a snake! his claws, and the movement of his eyes. All three species of butterfly were found on this sign! We played with some snap circuits for a while and learned a bit more about electricity and electrical currents. They spent a long time playing with some very large foam blocks building cars, hats, and seats. All the boys had a lot of fun playing with a plasma globe. We laid down on some long beanbags and watched a movie about frogs, toads and salamanders. It was a movie made in Connecticut and we were able to learn about all the local species with lots of great camera work that allowed us to really see each specimen up close. We learned so much and were excited to learn that much of the video was shot in and around vernal pools. The boys were happy to rearrange all the beanbags and made a mountain to lay on since we had the whole theatre to ourselves. We went into the Lego room. The boys tried to build earthquake safe buildings, race Lego cars and watch the different ways gears can mesh and various ways to make the parts move. We had a lot of fun playing with mirrors too. Evan and I tried to count how many Evans we could see inside the mirrored room. We watched how our bodies change as we flexed a mirror to be convex and then concave. The boys had fun sorting all the light pegs into colored groups and then told me they had made a graph. They compared which group had more, put them in order from greatest to least, told me how many more yellow there were than blue and a bunch of other "math" like facts.